We should be doing a Match Preview today but we aren’t. This is simply because our opponents this evening will most likely not show up. Unless of course by some strange twist of events, they do. But I don’t think they would or would they? Maybe they would or wouldn’t. Whatever folks. If they don’t show up, then they have nicely asked the LMC to bundle them out of the League. Should that happen, then it totally changes the outlook of the League starting from the table. All the teams who had gotten points off them will be made to relinquish those points as well as the players who scored those goals in the fixtures earlier in the season. Anyway, let’s just watch things open up. It’s a very sensitive issue but let’s just see how it goes. I was going through my iPad and I saw a post I wrote for this Enyimba team when things were looking horrible and sad and awry earlier in the season. Someone erroneously accused us at the blog of being supportive of a mediocre team and that we couldn’t criticize them like they deserved to. But that was untrue. We felt the anger and frustration and bitterness and what made it worse was coming up on the blog everyday to make some kind of defence for the team. So this morning, we are going to share that post I had primed then for http://www.supersport.com. It’s a lengthy one so we have truncated it below. Recent away results have been well, pathetic. Four losses out of four away games, this is an ‘Enyimbaless’ Enyimba side. Opponents will tell you home games versus Enyimba draw the largest crowds, be it in Bauchi or in Ibadan. It’s a tie that both teams and their fans look forward to. Massive ties probably as massive as the Elephant in the jungle and gate takings are usually the highest for the season. In recent times, teams get extra bonuses from their management for beating Enyimba, in other words teams are hyper motivated to get one over the League’s current defending Champions. Who wouldn’t relish such feat? News emerged that Rangers were given Two Million Naira following their 2-1 win a few weeks ago and Sunshine Stars equally, they got cash rewards after the very intense affair. Teams celebrate wildly if they come out tops on the day. Last season Enyimba won the title courtesy of an enviable away record. 23 points earned on foreign turf and 6 defeats all year. Tough venues like Ibadan, Ilorin, Port Harcourt and Bauchi were all favorable hunting grounds for the Aba side as well as lengthy unbeaten spells of nine matches each accomplished thrice that year. On the look of things, four defeats out of seven games already this term means last season’s heights look more unassailable by the day. The club made massive recruitment during the off-season, signing some of the very best legs available. Goalkeeper Theophilus Afelokhai joined from rivals Kano Pillars, Dare Ojo was plucked from relegated Kwara United, Christian Pyagbara from Sharks and the Warri Wolves dynamic trio of Abu Azeez, Ikechukwu Ibenegbu and Joseph Osadiaye among a host of others. Hardly any one of the new players who would not walk straight into the starting eleven of any team in the country. But the sad reality that fans are discontented with the side’s current awful away form. So what exactly is wrong? Beyond just the appointment of Paul Aigbogun who remains one of the better gaffers in the Championship, something is lacking in this Enyimba side. Enyimba’s current longest serving player, Emmanuel Anyanwu revealed in an interview last year of a certain orientation given to players when they arrive at Enyimba. 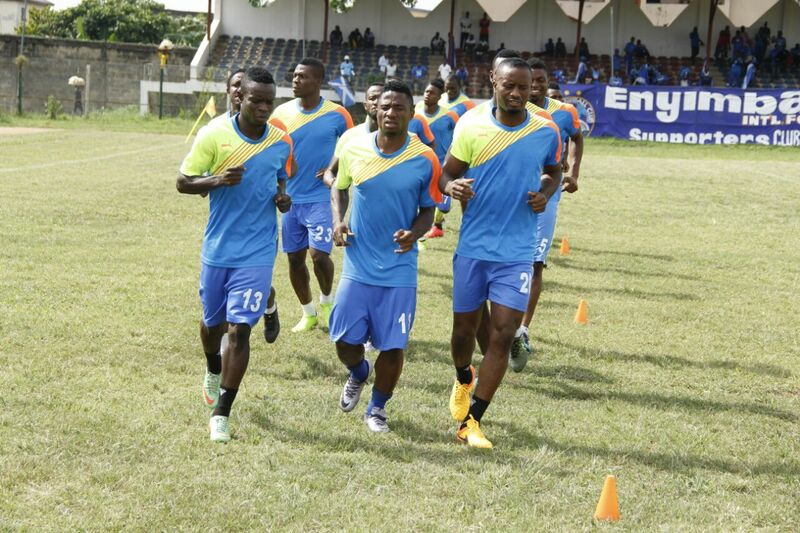 They are indoctrinated with the Enyimba tradition, taught that Enyimba is more than just a football club. Initiated to the Enyimba spirit and taught the famous Enyimba anthem, with one of the lines- “We promise not to fail our fans…” engraved on their minds. Bottom line; it is ok for teams to lose away from home but not Enyimba. Winning home games is the easiest thing to do in the League (home of course has been away from the Enyimba fortress for the team this season for which the team deserves huge credit) but to win away, the team must not be lacking an identity. This decent congregation of excellent professional footballers are bereft of a team identity and they have yet to come to terms with the huge expectations of the Enyimba clan. Not totally surprising because the average starting lineups this season has not seen more than three players who have been at the club for more than four years. OK, it’s okay. We’ll pause there. But you could see the general theme of the post and where it was heading. We were hurting as much as any and every one who voiced their frustration on social media. Thank God that we have found ourselves some form and the lads have garnered some understanding amongst each other and we look on the way up. Right now, this Enyimba side is still far away from a finished product but we are getting there. There are still some permutations yet to click and there are quite some rough edges in need of proper finishing. But like we have always learned, throwing away the dirty child with the dirty water has never helped anyone. A team can do better with encouragement than we repeated blames and accusations and highlighting errors. OK, I’m done for today. If Giwa do show up for the game today, then there will be a match report for you when I’m back tomorrow. Till then, be good. okay… let’s just hope the guys shows up because probably they will like to lose to send a message to their owner. ala adighi Mma bu uru ndi nze! !